A total solar eclipse will occur on Friday March 20, 2015. A solar eclipse occurs when the Moon passes between Earth and the Sun, thereby totally or partly obscuring the image of the Sun for a viewer on Earth. A total solar eclipse occurs when the Moon’s apparent diameter is larger than the Sun’s, blocking all direct sunlight, turning day into darkness. Totality occurs in a narrow path across Earth’s surface, with the partial solar eclipse visible over a surrounding region thousands of kilometres wide. It will have a magnitude of 1.045. The longest duration of totality will be 2 minutes 47 seconds off the coast of the Faroe Islands. It is the last total solar eclipse visible in Europe until the eclipse of August 12, 2026. At the end of its path, the shadow of the Moon rises from Earth’s surface to space at the north pole. As March 20 is the Northward equinox, the eclipse occurs as the Sun rises at the North Pole after six months. There will also be a Supermoon, or perigee moon, the evening before the eclipse, meaning the Earth and Moon are as close together as they can be. This makes this 2015 Spring Equinox eclipse a supermoon eclipse, meaning a supermoon, equinox and eclipse will all fall on the same day. The only populated places where the totality can be seen, reachable by public travel, are the Faroe Islands and Svalbard. It’s a Total Solar Eclipse in the Faroe Islands and Svalbard (Norway), and a Partial Solar Eclipse in Europe, northern and eastern Asia and northern and western Africa. The eclipse starts at 07:41 UTC and ends at 11:50 UTC. The March 20 total solar eclipse event will be the first since Nov. 3, 2013. The dark umbral shadow cone of the moon will trace a curved path primarily over the North Atlantic and Arctic Oceans, beginning off the southern tip of Greenland and then winding its way counterclockwise to the northeast, passing between Iceland and the United Kingdom. Parts of the UK could see a partial Solar Eclipse. How much of the eclipse could you see and what time? This guide can help! You can obtain specific information on the March 20 eclipse in your part of the world at the sites listed below. Be sure to watch whether the times are given in Universal Time, meaning you must convert Universal Time into your local time. Can’t see it from your part of the world? On March 20 – same date as the 2015 March equinox – the moon turns new only 14 hours after reaching lunar perigee – moon’s closest point to Earth in its orbit. Thus this moon is a supermoon – at the new phase – not visible in our sky, but having a larger-than-average effect on Earth’s oceans. Plus this new supermoon swings right in front of the equinox sun on March 20, so that the moon’s shadow falls on parts of Earth. Follow the links below to learn more. This is the first time that an eclipse has a significant impact on the power system, and the electricity sector is taking measures to mitigate the impact. Places in Netherlands, Belgium and Denmark may be 80% obscured. Temperature may decrease by 3°C, and wind power may decrease as winds are reduced by 0.7 m/s. The European Union has about 90 Gigawatts of solar power and production may temporarily decrease by up to 34 GW of that if the sky is clear. The power gradient (change in power) may be −400 MW/minute and +700 MW/minute. 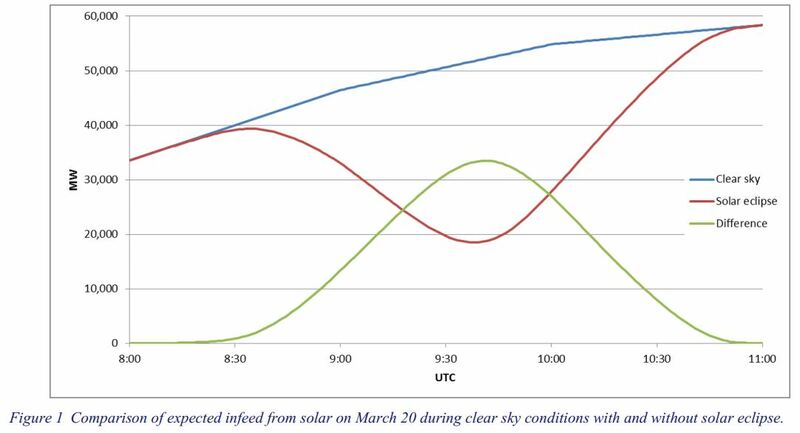 Solar Eclipse 2015 – Impact Analysis.pdf European Network of Transmission System Operators for Electricity, 19 February 2015. A total lunar eclipse will follow on April 4, 2015, visible over Australia, and the Pacific coast of Asia and North America. Each member in a semester series of solar eclipses repeats approximately every 177 days and 4 hours (a semester) at alternating nodes of the Moon’s orbit. Great write-up, I am normal visitor of one’s website, maintain up the nice operate, and Im going to be a regular visitor for a lengthy time.